As most of you know, yesterday, the Republicans in the Senate passed a Motion to Proceed on the repeal (and maybe replacement, but probably not) of Obamacare. For the first three months of the Trump regime, I thought repeal of Obamacare was inevitable. But the actions of #TheResistance and the Democratic Party have combined with the absolute incompetence of Donald Trump and the Congressional Republicans to make that unlikely. Side note: I really do believe keeping Trump in office but beleaguered -- maybe impeachment without conviction? -- is better than elevating Pence. I think we can pretty much guarantee that without the Trump drama, 20+ million people would definitely lose their health insurance. While the Republicans are technically procedurally closer to repealing Obamacare, it seems unlikely to me that the Republicans will be able to put together a bill that not only unites all of their factions in the Senate, but also does so in the House, and passes the muster of the parliamentarian. MJ Lee and Lauren Fox at CNN explain what to expect. Also, it doesn't help things that despite the fact that I don't think Obamacare will be repealed, the potential impact on real lives of Americans that the small chance that this evil bill (whatever it looks like) is SO horrible that it's excruciating to contemplate. I'll try to check in a bit more often over the next few weeks, but in the meantime keep fighting. 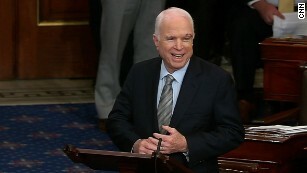 If I'm disgusted by Dems clapping for McCain it doesn't mean I'm a cynical person. It proves I'm justified in being cynical about politics. He's never been a good guy, he's no hero (maybe the *only* thing I agree on with Trump), and while I hope he recovers, I also hope he stops having any involvement in our politics and never appears on a Sunday news show again.